It’s a tough time for traditional supermarkets. Competition from small-format grocers, C-stores, meal kit providers are all increasing, while consumers are coming into stores with ever higher expectations. 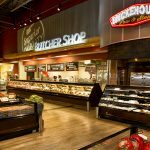 The supermarkets that are succeeding are evolving their business models with more and more adding in-store hospitality areas. Hospitality areas—coffee shops, restaurants, beer gardens and the like—tick off a lot of boxes for supermarkets. The new retail concept generates much higher margins than the shrinking dry-goods aisles, differentiates supermarkets from competitors, increases dwell time and attracts Millennials, who love them. A common mistake supermarkets make is installing some sort of hospitality area, but not demarcating it from the rest of the store. Hospitality areas should function as oases, signaling a place of luxury and relaxation inside the grocery store. 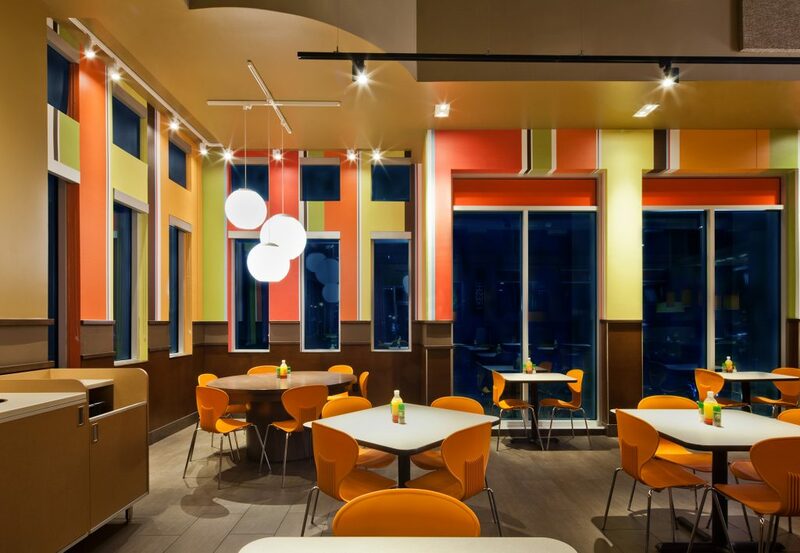 A key ingredient to an in-store coffee shop or restaurant, aside from the hot drinks and food, is the lighting. Dry goods aisles have bright white lights for general illumination and produce departments need cool lights to showcase the natural color in the food. Hospitality areas need warm lighting that invites customers. There’s nothing more inviting than the warm incandescent tones we have in our homes. Warm-toned LED lighting makes the hospitality space feel hospitable—it feels like home and welcomes customers. Early LEDs were known as cool, white lights, but modern LED technology can be warm, cool, or both—cool at full power and glowing warmer as the light is dimmed, emulating the familiar incandescent lamps. Traditionally, grocery stores have been places to buy food to eat at home and restaurants have been for food to eat away from home, but that’s not necessarily the case anymore. Nielsen (yes, the TV ratings company) reports that the “lines are blurring” between restaurants and grocery stores. Enter the “grocerant,” a grocery store with restaurant options inside. Of special interest to Millennials, these hospitality spaces enhance the overall grocery shopping experience. Traditional supermarkets are struggling with Millennials’ perception of the shopping experience and Millennials are the least likely of any generation to be loyal to a given store. In fact, Acosta’s 2017 “Trip Drivers” report notes Millennials will often visit three or more stores for their regular shopping. Millennials place a premium on experience and to keep up with shopper expectations, supermarkets are transforming into destinations, featuring things like fresh, local produce and restaurants. This experience-centric mindset supermarkets are adopting helps younger shoppers connect to the store brand and can build loyalty. Supermarket hospitality areas also help stores combat the foot traffic that online shopping has siphoned off. “Consumers rate visits to grocerants higher than traditional quick service restaurants on variety and healthy options,” notes retail research firm NPD Group. These areas are also of particular importance to Millennials. Clearly, in-store hospitality areas are an effective competitive differentiator and revenue generator for supermarkets. But, to reap the most benefit, it’s critical that grocery stores illuminate these areas appropriately. Lit with comfortable warm light, they will stand out across the store to tired shoppers as oases of relaxation. Lit with bright aisle lights, however, customers will keep walking past. Amerlux has been lighting supermarkets for nearly 40-years. We know supermarkets. Learn more about Amerlux’s supermarket lighting solutions.